We are excited to give you a sneak peek of our spec home that will soon be complete and available for sale in Santa Fe. In addition, this one-in-a-million home in Las Campanas will be featured in this year’s Haciendas – A Parade of Homes. Woods bought this home’s lot three years ago, one of the last premium lots left in Las Campanas, which features two championship golf courses, spa and tennis center, equestrian center, an upscale restaurant, and world-class amenities sought after by people across the country. 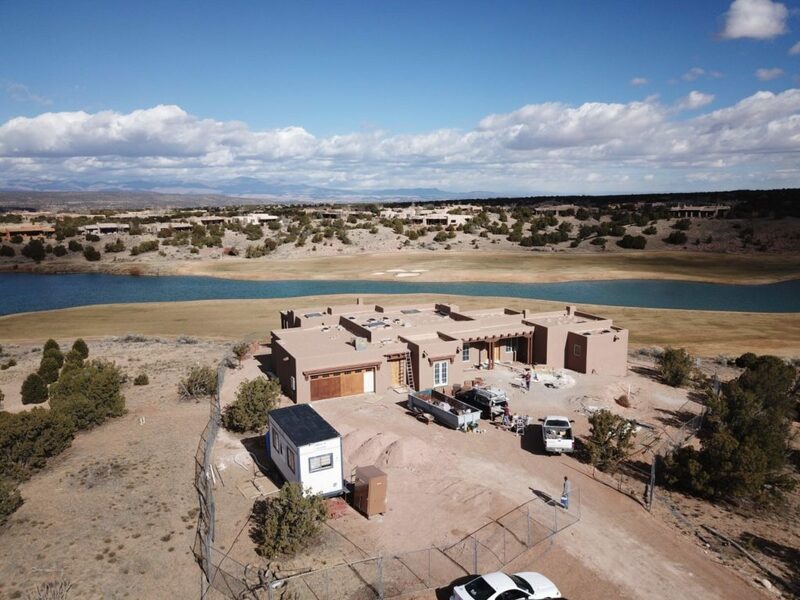 This home’s lot is particularly special: it is situated right next to the clubhouse, is within walking distance to amenities, and overlooks a lake and the convergence of the 18th holes of Sunrise and Sunset championship golf courses (ranked #1 and #3 in the state of New Mexico), all with the backdrop of breathtaking vistas. With such a spectacular lot, we knew we had to build a classic Woods home: Santa Fe architectural style rooted in timeless design featuring the latest in modern amenities. We spent over a year designing this custom home. With so many spectacular views to take advantage of, our goal was to create a design that captured and highlighted the view from every room, flooding the home with natural light. The home’s traditional, pueblo-style architecture seamlessly blends old and new featuring large masses of glass, soaring high ceilings and portals, and classic details and proportions. The interior boasts a light, buttery, hand-applied, finished plaster, Taj Mahal granite, custom Knotty Alder white-painted wood cabinets, white oak floors, hand stenciled Tabarka tile, reclaimed interior doors and an antique limestone fireplace from France. As you enter the Zaguan (throwback to historic Santa Fe Architecture) entry hallway, reclaimed TerraCotta stone is underfoot, and a perfectly framed mountain and lake view greets you beyond an expansive wall of glass. To the right lies the private master suite replete with an office, oversized bedroom and sweetheart deck. Left of the Zaguan opens to sprawling living, dining and kitchen rooms featuring a livable and functional open floor plan. In addition to classic Woods architecture, the home will be shown fully furnished with the finest furniture, art, and rugs hand-selected by Paul & Michael of Violante & Rochford Interiors. The 4,069 square foot home sits on a 1-acre lot in Las Campanas. Priced at $2.45 million, the new owner will enjoy a stunning new custom Woods home with world-class amenities at their doorstep. This one-of-a-kind home will be listed for sale in June 2018. Give us a call at 505-988-2413 to schedule a tour.